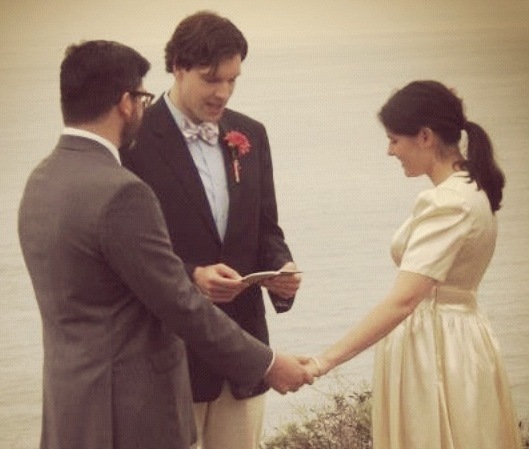 When Anne and Tommy asked me to officiate, I told them I didn’t think I was allowed to do that. But I realized later that I had done it already. I remembered the two of them coming to visit me in Ocean City a few years ago. We woke up one morning and went down to the beach. They said that they wanted to go into the Atlantic, but I declined, favoring a stay on the sand. I remember: watching these two pale figures wade out into the surf, hand in hand. Wasn’t that as much a ceremony, and for me to witness, as this? What does one say about marriage anymore? My dad has been marrying & divorcing people for 40 years now: for about as long as he’s been married to my mom. I understand the practical reasons why marry still; but why else? I don’t know why; or why an irrational part of me still wants to get married just as one gets sick or gets a new car. So Anne & Tommy asked me to marry them, and I said yes back in May, but waited until August 12, 2012, to receive my minister’s license, ordained through the Internet, and then waited even longer to think of a proper definition that I could provide for marriage; an appropriate welcoming and framework for the ceremony. I read a draft to Robbie as we waited in a smokey casino bar for Alanis on Wednesday. After I had finished, and was spelling out my own litany of concerns about the text, Robbie quietly offered, “You’re usually so eloquent,” which was such a somewhat stinging yet astute thing to say. So last Thursday, in a post-Alanis haze, I was beside myself; fretting over what would be the final summons. My friend Emily stopped over for a moment to pick up a book for class; we sat out on my back deck & talked of love (how our own hearts fill up with the fluid still) & then of marriage, and of her own first marriage. She said, “I remember my husband saying that he realized that my hand was the one he would be holding when our parents died;” and she said she had thought of that recently and was so sad that it wasn’t going to be true, having divorced two years ago. But that is why; that is what I want too, still. But my mom said the other day, when I had returned from the wedding, “All I wanted was for you & your sister to find significant others who would appreciate you. But I’ve given up thinking that will happen.” And that, too, was––such a thing to say. But we gather here today so that we can offer our love and support to these two. To remind ourselves that we find a sanctuary in each other as human beings. And my dad, when we were out to dinner the night before I caught my plane to the west coast, said, “Just relax. Relax and have fun. They obviously love you a lot to ask you to do this.” And it must be true; and isn’t that another sort of sanctuary there? Emily also suggested I look at Shakespeare’s thoughts on marriage; or Jane Austen’s, though hers tend to prefer pragmatism, I find. Or how about: Anne of Green Gables? Be unafraid now. Be unafraid to say to this other person: “Ok.” To know that life is difficult, but that we all get through it––so why not together?––so long as you are both going in the same direction already. That you have found a common sympathy. Just as I watched you both do on that day as you waded out into the Atlantic, that you will take each other’s hands many times throughout these ensuing years: in times of celebration, of loss, times of uncertainty, but mostly in quiet moments. This entry was posted in Marriage & What It Is For, Summer & All. Bookmark the permalink. 2 Responses to A Lovely Excuse for Sandwiches. I would get married just to get you to marry me. Me too! This is so gorgeous. So real.